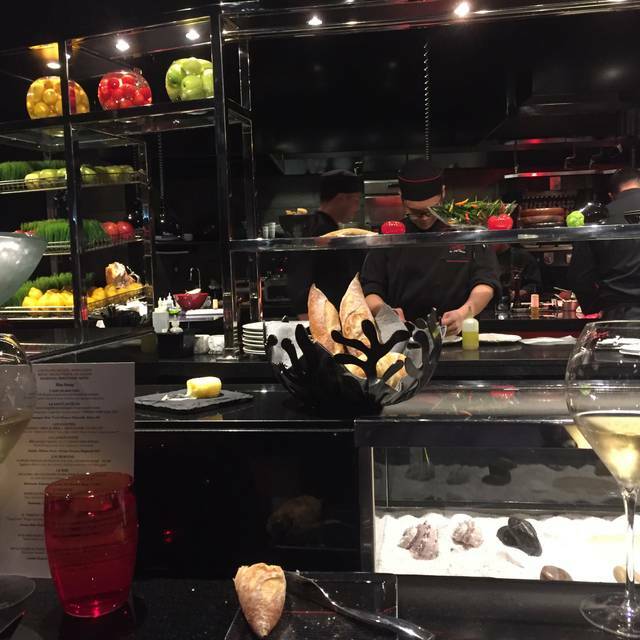 You must make reservations at least 5 minutes in advance of the time at L'Atelier Joel Robuchon - MGM Grand. 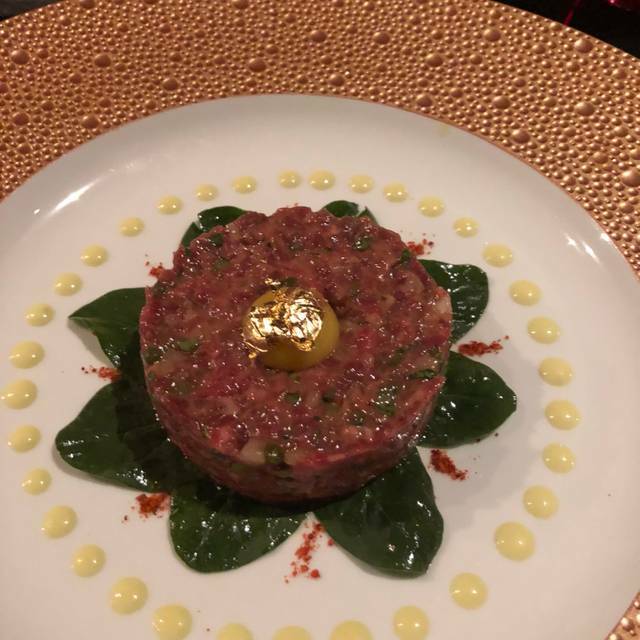 A masterpiece from France's Chef of the Century, L'Atelier de Joël Robuchon is the culinary workshop of the gourmet mastermind. Featuring unique counter service where your dinner is prepared right before your eyes. Enjoy tapas, a tasting menu, and wines from around the world in a friendly and interactive atmosphere. Food was delightful and service was above and beyond. Fantastic food let down by some poor service (our second main course took 45 minutes to arrive as had been missed/forgotten and we had to ask where it was!!) Would assume this is not the norm and would definitely recommend or visit again. Food was very good. Portions are very small and prices are very high. Was a nice evening but not rushing back. The food was better than expected and my expectations were enormous. The staff was not just attentive, but they were focused on the customer. Everyone was constantly working toward making our experience excellent and they accompanied that goal! We chose to be seated at the bar area overlooking the kitchen. My partner and I had the seasonal tasting menu and were thrilled with the entire experience - highly recommended!! One of the best restaurants on Las Vegas. A little expensive but well worth it. 5th time here including NYC location. Not the stellar experiences the other visits were. Maybe my own fault as I strayed from the tasting menu this time. 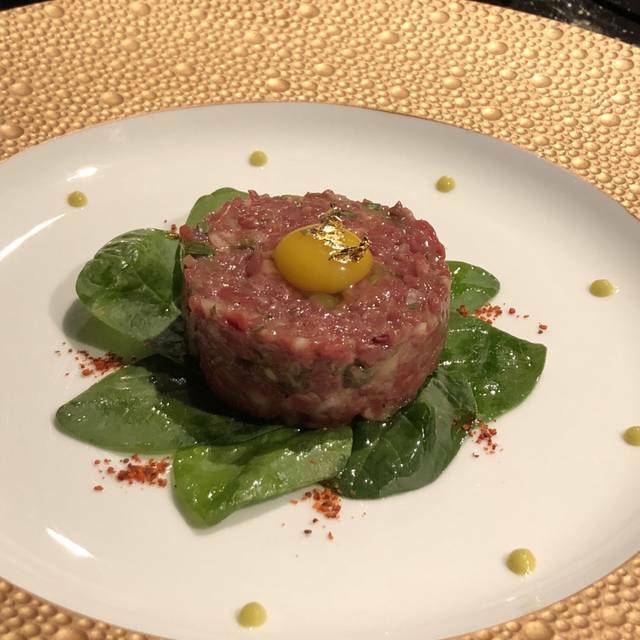 L'Atelier is a great restaurant but the attention to detail in Las Vegas is lacking a bit. The hostesses were unfriendly. The waiter was aloof. The sommelier was excellent, though - and introduced me to a Premier Cru St. Aubin - when I did not even realize they had PC St. Aubin. The King Crab salad was one of the best dishes I have had with chunks of King Crab, tomatoes, grapefruit and avocado. Simple, but perfect. We did think we spotted a piece of mold on the baguette they served, but they assured us it must be a misplaced spot of pesto sauce. Normally finding mold on one's food would cause someone at the restaurant to buy dessert or coffee or something. We would never ask but were a little surprised that this was not done. We have been to L'Atelier all over the world. I hope this was just a mediocre experience and not a sign that the franchise is losing its edge. We had an amazing dinner here. The ambience was wonderful. Watching the chef and line cooks prep the meals was a treat as well. The wait staff does a wonderful job bringing your meal out piece by piece and explaining each dish to you. This gives you ample time to relax and truly enjoy your meal- which was delicious. I had the pea soup and the crab fritters to start. Both were excellent. 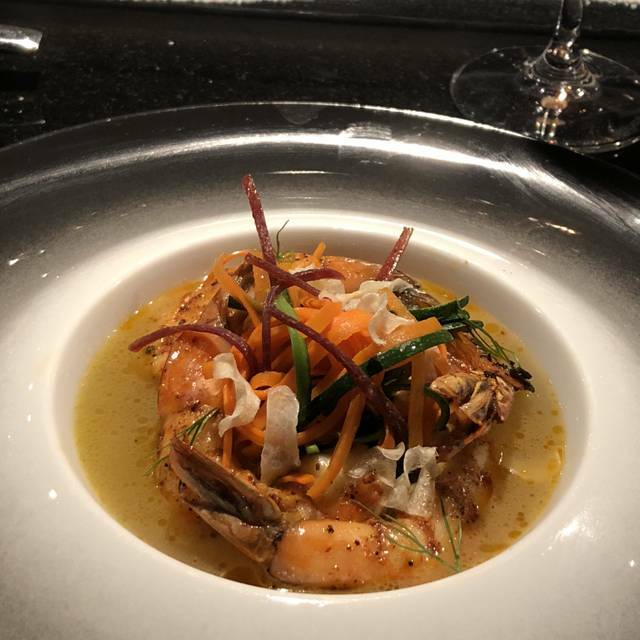 My husband started with the crab and grapefruit salad- which was even better (I wished I would have ordered this after trying a bite, though my dishes were still excellent). I was disappointed with my main dish- the beef short rib. The presentation reminded me of fancy feast cat food (shape and textures) and the taste was that of perhaps something you’d find at cafeteria. I am also quite used to short rib on the bone, not shredded and mushed back together and covered in sauce, so perhaps it was just not what I was expecting or used to. That being said, my husband loved his pasta. He had zero complaints. Our desserts were equally amazing as our staters. The chocolate sensation was amazing and if you’re a chocolate lover I highly recommend this. We arrived early and were given great the great corner seats at the bar. Unfortunately, later in the meal the seats were in a bit of a wind tunnel and the amazing food got cold quickly. The only flaw to a gorgeous meal. Absolutely fantastic meal, the only issue was the service from our particular server. As nice as he was most of the evening he made an error and had the wrong response. I had brought in an epic 1989 cote rotie syrah and had kept it horizontal for days, i brought the wine in horizontal and had it held in a cradle. Our server grabbed the wine out of the cradle and turned it upright potentially disturbing all of the sediment in the wine. When we kindly mentioned it to him, he said “i assure you i disnt disturb the sediment ive handled a lot of bottles of wine i was very gentle”. Clearly he hadent or he would know if a wine bottle is in a cradle you NEVER turn it upright. Proper storage label up and gently moved via cradle is how all wine service should be expected on back vintage wine at a michelin star restaurant. The attitude about his prior experience and knowledge of how to handle wine bottles only furthered the irritation. A simple “whoops my mistake so sorry lets let that relax in the cradle a bit” would have been just fine. Beyond this short interchange everything else including the actual sommelier was fantastic. Food wasn’t inspired. Ordered tasting menu with wagyu beef supplement ($45). 12 oz steak cooked on flat iron grill with just salt and pepper. Expected more for a $98 steak. Overall wasn’t anything special for $500 dinner. We chose the seasonal prixe fixe menu. For nine well-prepared courses, it was a good value. The fois gras and scallop carpaccio were exquisite. My husband is diabetic and requested to substitute one of the desserts for a cheese selection, and the waiter was agreeable. 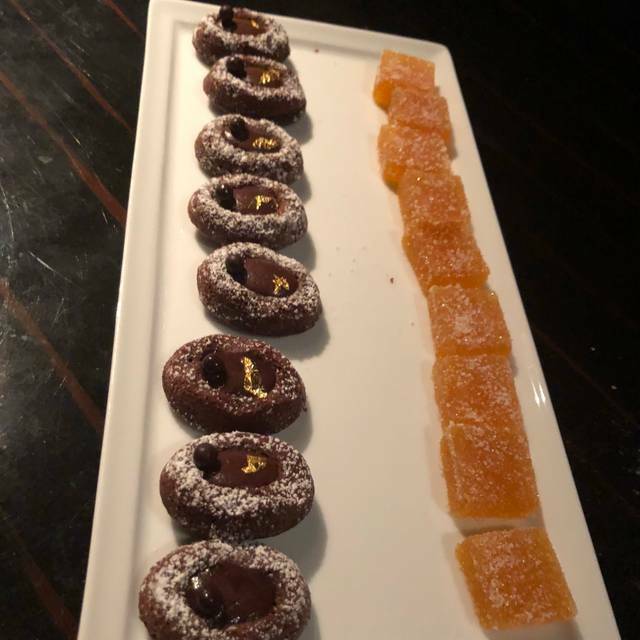 However, when the course arrived, he received the dessert listed on the menu instead. I would expect greater attention to detail from a restaurant of this caliber. Always a favorite each time I go to Vegas. The food cannot be beat. I am amazed with the chef's staff there. When you sit at the bar, you get to watch them prepare your meal which is artistry in itself. 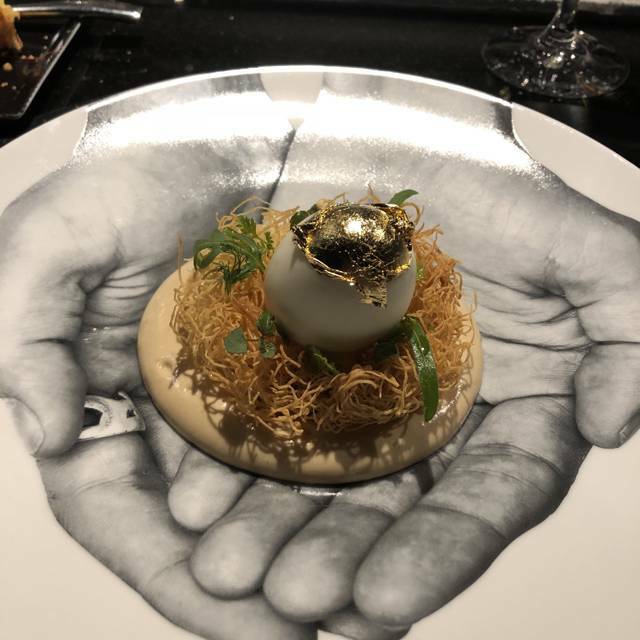 L'Atelier never disappoints. Delicious from start to finish. Attention to detail. Appetizer salmon was great-quail and pasta carbonara was perfect. Drinks and carpaccio delicious. Perfect! Great food and service. The fish was outstanding and my wife had the steak. Great wine selection and the deserts were out of this world! Each course was beautifully presented and the food itself was devine! Truly a great dining experience!!! The food was outstanding! We had the seasonal discovery menu and every course was better than the next. I was immediately sick after eating L'entrecot on the menu here. The dish was flavourless, the service was terrible. 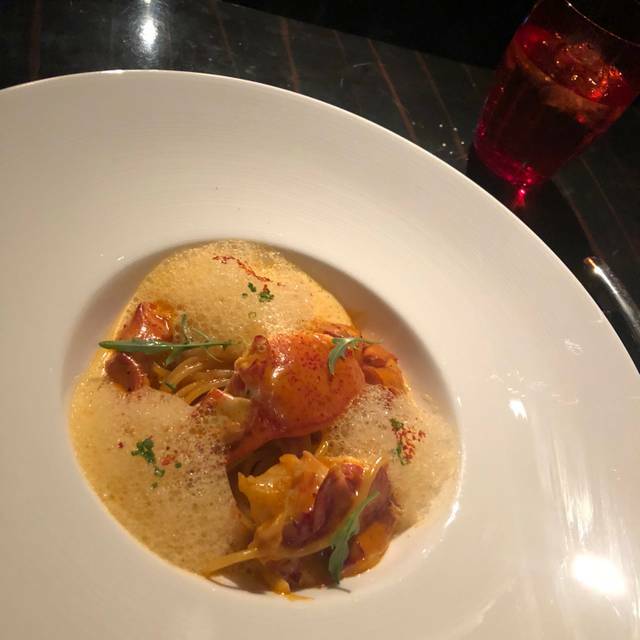 When I complained about the dish, the manager (Fabien) called security rather than address the complaint of poor food quality. Love the menu, ambiance and service! Absolutely fabulous meal from the bread (that one word doesn’t quite do justice to the delicious options!) to the decadent desserts. A little pricey...but in keeping for this special “dining experience” in Vegas. Service was outstanding. Decided to eat here for its convenient location next to the Ka theatre, but would make a special trip just to enjoy dinner. Excellent food!! Cocktails were just ok, and dessert was pretty boring (Oreo ice cream dish). For those prices, I expect everything to be excellent, not just the food. Wonderful cuisine and service! It’s inside a casino hence the 4 stars for ambiance but def great decor and feel! From our first encounter with the manager and hostess at the front door to the final goodbye, our experience was graciously attentive, pleasing all our senses. Our service staff maintained a gentle and consistent presence, checking on our satisfaction during every stage of our 4 course pre-theater prix fixe. 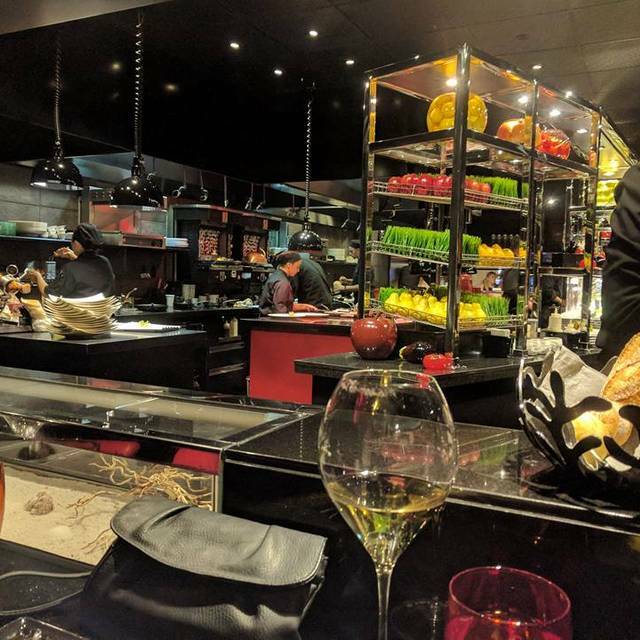 Being vegan and gluten free, I placed my experience in the hands of a capable staff that quietly worked together in providing a seamless evening. Each dish presented was bursting with hidden flavors and unexpected textures. The platings were intricate and intentional works of art, prepared by a careful precise presentation kitchen staff armed with tweezers, medicine droppers and a myriad of high end equipment. We left with an experience that transcended the details, and wish to extend our thanks to the staff for providing us a week of pleasant, delicate memories to feast upon. Extraordinary food. It’s not cheap but it’s totally worth it. Their lobster with rosemary is exceptional and their wagyu entrecôte is perfectly cooked. My wife’s foie gras ($51 for barely 1.5oz) was bitter and grapefruit that it came with added even more bitterness. My halibut came undercooked and flavorless. There are many other places in Las Vegas that serve much testier food for less. We will not be coming back. Been going there for years. Food was as usual but the service was a little bit slow in between courses. I found that odd since the restaurant was not even at Half to the capacity. Lovely restaurant, really enjoyed sitting at the bar and observing the chefs and food prep. The beef short ribs were very good. The halibut was disappointing and dry. Cocktails, appetizers, and desserts were excellent and they were accommodating of our pre-show timeframe. Overall, a good (but not great) experience. manager lost my reservation and stated the wrong time. I showed him my email with the confirmation and he had nothing to say, did not apologize and we still had to wait a long time for dinner which to me was generally overpriced for what we ate. Espectacular experience! Smart choices would allow you to make it a life experience at a competitive value. Their options are flexible, their concept is highly interesting, and food/service is top notch! One of the better meals I have had ever. Wonderful French Cusine. Very attentive and seem less service. What a great dining experience. Must try the tasting menu with wine pairing. We are big foodies... not sure if all the reviews hyped up my expectations, the food was good but did not wow my pallet. The service was ok. They started removing my husbands dish before he finished. The food came out pretty quick, one after another. Would have been nice if they paced it a little.